We might look at the world today and consider Peabody’s faith in humankind a little naïve. If, however, you are tempted to do so, and need proof of how far we human beings have progressed in, oh say, the last 400 years, you need only crack the pages of Joel F. Harrington’s engaging book, The Faithful Executioner. You might wonder why someone would write about so gristly an occupation as court executioner, and you might be tempted to shrug it off and pass it by while perusing the shelves of your local bookstore. That would be a mistake. The Faithful Executioner is much more than a description of the many imaginative and horrifying means of torturing and putting prisoners to death. It is a rare and utterly fascinating examination of the society that demands it. If you want to know what a population’s values are, take a look at how it handles the issues of crime and punishment. You will be impressed by how practices that were acceptable, even condoned and relished in the 16th century, fill us today with dread and revulsion. We might be tempted to judge that period as barbaric and inhuman, but the historian must avoid such judgments. The intervening centuries with their own values and ethics have to be drawn back like gauze curtains so we can see that period as it really was and not as we would wish. Author Harrington manages to give us history without judgment. 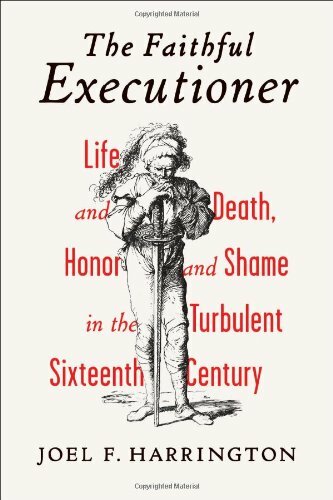 The Faithful Executioner is a rare firsthand look at a profession that has suffered much from stereotyping, for it is drawn from the diaries of Nuremberg, Germany’s chief executioner, Frantz Schmidt, who held the post for 40 years. A published version of that remarkable journal fell into the hands of the author while he perused the shelves of a Nuremberg bookstore. This rare personal account is the armature upon which Mr. Harrington’s narrative is molded—and an intriguing narrative it is! The diary itself is sparse, mostly recordkeeping of the many cases in which his skills were required with only occasional personal observations. Mr. Harrington succeeds admirably in filling in the details that Schmidt omitted. His intimate knowledge of the life and times of Frantz Schmidt engagingly reproduces a portrait of the social, political, and ethical world in which Schmidt practiced his craft. Make no mistake about it: His was a highly skilled, regulated, and specialized craft. It was passed to him from his father, who trained him. There was even a guild for certifying professionals. The executioner was a respected officer of the court; its obedient servant. He was meticulous in carrying out his orders to the letter. As the man who executed the will of the judicial system, he was expected to accompany the prisoner from the time of his or her arrest to the time when the final punishment was accomplished. A word or two about justice in the 16th century: The central authority of the courts over trials and punishments was relatively new and generally suspect. Central authority was only instituted and agreed to by the public to prevent a cycle of revenge and retribution carried out by private individuals, families, or villages. That authority was accepted only as long as the trials and punishments were indeed just, or to be more precise, was perceived as just. If the aggrieved parties were not convinced that justice was done they would fall back into vigilantism. Gleaning information from Frantz’s diary, Mr. Harrington presents to the reader a lawless and brutal world. In addition to the common run of highwaymen, burglars, murderers and others who were just up to no good, mercenary soldiers between wars and with no other livelihood roamed the countryside looting, killing, stealing, and generally making life unbearable for the villagers. Why public? Doesn’t that seem to us a bit ghoulish? Well, yes. We are more civilized after all. But in the 16th century the mostly illiterate public had to see justice demonstrated, which served two purposes: It created among them the perception that they were protected from evildoers in a most precise manner as dictated by an objective court of law; and secondly, it filled them with terror as to what might await them should they commit the same crimes. The public execution was a deterrent. More disturbing to us, though was the executioner’s function in investigation and what we would call today enhanced interrogation. Torture. In this as in all things, the executioner was subject to the will of the court. Physical torture, Mr. Herrington tells us, was considered a last resort. First, Schmidt showed the prisoner the instruments the court has dictated he use, telling him—or her—what might be expected. Many times, intimidation alone was sufficient to get the information needed. Usually that meant a confession. How did Schmidt feel about his profession? When even so august a personage as Martin Luther referred to the executioner as “the hand of God,” any guilt about routinely taking human life is somewhat mitigated. In the diaries, Schmidt chooses to dwell on the crimes that justified such treatment. In short, the prisoners deserved the treatment he meted out. It is ironic, though, Harrington writes, that the executioner’s intimate knowledge of the body, injuries, and illnesses, suited him for an auxiliary profession as a healer. Schmidt did a thriving business as a physician. Makes sense. After closing the book we are struck by two things: a renewed understanding for a profession that while respected was not honored in the way other professions were (families of executioners were not allowed into any other profession and were socially shunned). We also come away with a profound sense of gratitude that we live in the 21st century, not the 16th. Despite all the ills of our own world, it is fair to agree with Endicott Peabody. We are making progress. We have come a long way.